This past week I had planned on making two soups that both needed onions, celery, and carrots. I knew I had purchased celery and carrots the week before, so I did not pick any up at the grocery store on my normal grocery day. Well, when I got home from the store and was putting all the groceries away, I noticed that the carrots and celery weren't looking so fresh and I knew they'd be ruined by the time I needed them. I did NOT want to waste them AND I did not want to run out to the grocery store again. So I decided to go ahead and pre chop the onions, celery, and carrots and put them in freezer bags all labeled with the recipe they were to be used for. YAY!! Usually chopping veggies is what takes the longest in any soup recipe (well, other than a long simmering time). This was such a time saver and came in SUPER handy when the days came for me to make the soups for my family. Hooray for saving both time AND money by chopping the veggies before they went bad. I shared before about pre chopping and freezing veggies, but this time I froze them and bagged them according to upcoming recipes instead of just freezing all the carrots together, all the celery together, etc. Such an easy idea that saved me time the day of cooking. What soups did we have??? Oh y'all. DELICIOUS soups!! First we had Disneyland Loaded Potato Soup recipe that I found here. YUUUMMMMMM. Well, except I left out the corn because I don't love corn. And we also had Chicken Orzo Soup. Very very tasty!! This is the second time we've had this. I think this is going to be one of the family's favorites for a while. I'll be sure and share that next week!!! They kindly featured my post here as one of their November STARs. And a huge THANK YOU to Miz Helen!!!!! This is such a great way to prepare ahead of time. Plus it gives you more room in the fridge. Great reminder of how easy it can be to salvage those veggies before they go bad, and still put them to good use. 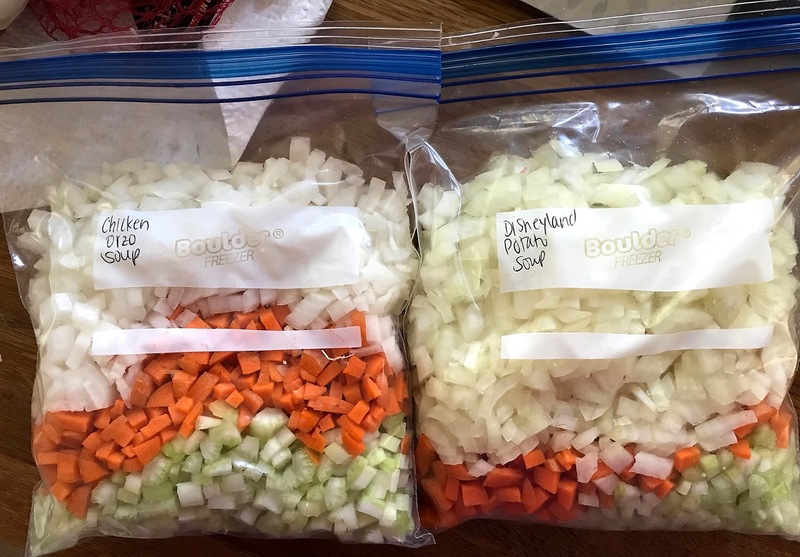 Terrific idea to package them in a way that's already prepped for your favorite soups! I love this idea of special bags for different recipes, this is awesome! Thanks so much for sharing your post with us at Full Plate Thursday! Have a great week and come back to see us real soon! Your post is featured on Full Plate Thursday this week and we have pinned it to our Features Board. Thanks so much for sharing with us and sure hope you enjoy your new Red Plate! Thank you, Miz Helen, for the honor of being featured on your blog this week!!!! WOW!!!! Thank you, Angelique, for featuring this post as a November STAR!!!!!!!! I'm so honored!!!!!!! Dish drainers- do you or do you not?